Mercedes-Benz E-Class Interior, Sat Nav, Dashboard | What Car? 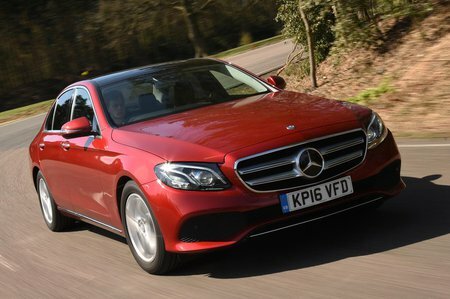 The E-Class looks and feels very much like a baby S-Class limousine from behind the wheel – and there are few bigger compliments than that. The giant display that appears to stretch continuously from the centre of the dashboard to behind the steering wheel is optional, but it’s well worth considering because it puts more information closer to your line of sight. That is, at least, unless you’re much more than six feet tall; if you are, you’ll probably find the steering wheel blocks your view of the top of the screen. All versions of the E-Class come with an electric driver’s seat to help you fine-tune your seating position, although it’s a shame you have to pay extra for adjustable lumbar support. Meanwhile, the dashboard is easy enough to get your head around, if not quite as logically arranged as those in the rival Audi A6 and BMW 5 Series. E220 d versions come with a Garmin Pilot sat-nav system as standard. We haven’t tried this on the E-Class, but we have tried a similar system on the smaller C-Class – it does the job but it’s far from the fastest or the most intuitive system on the market. However, you do at least get DAB radio, Bluetooth, a USB socket and an 8.4in colour screen, and you can control everything using a rotary dial positioned between the front seats or simply by speaking. Unfortunately, the latter functionality isn’t quite as straightforward as it sounds, because the car doesn't always recognise what you're saying. The E350 d and E300 e get a much more sophisticated Comand system (this is optional on the E 220 d). It brings a larger (12.3in) display, more user-friendly menus and quicker-responding software, plus an in-car wi-fi hotspot, Android Auto and Apple CarPlay. Interior quality is one of the Mercedes’ strongest suits. The E-Class runs the 5 Series close for quality and even matches the A6, yet it has a far more flamboyant-looking interior than both of those cars, which many buyers will appreciate. The materials used to construct the cabin are mostly classy and the buttons and switches, in the main, operate with precision. The signature glossy black centre console makes just as much of a visual impression as it does in the smaller C-Class, but in the E-Class it feels more solid and doesn’t flex and creak so obviously when you prod it.